Upcoming appointments offer Gov. Whitmer an “opportunity to really push things” where her predecessor didn’t, advocates say. This year, the MPSC will review DTE’s and Consumers Energy’s long-term integrated resource plans, examining how the utilities will transition from coal over the next 20 years. The MPSC also delves further into policies affecting rooftop solar and third-party renewable energy developers. It could initiate proceedings that are more favorable to the build-out of renewables rather than utilities’ attempts to limit them, such as with net metering. One MPSC position is vacant after Whitmer appointed former Commissioner Rachel Eubanks as state treasurer. The term of Republican Commissioner Norm Saari, who was appointed by former Gov. Rick Snyder in 2017, expires July 2. While Saari could be reappointed, sources say it’s unlikely that Whitmer will reappoint a Republican to the position. The third commissioner, Sally Talberg, is an Independent, which means Whitmer can appoint two Democrats without violating a rule allowing no more than two commissioners from the same party. Multiple sources say those recommended for the MPSC vacancies include Dan Scripps, a former state representative and program director for Midwest policy at the Energy Foundation; Ariana Gonzalez, senior energy policy analyst at the Natural Resources Defense Council; and former state Sen. Mike Nofs, who chaired the Senate Energy and Technology Committee before being term-limited out of office this year. Nofs said he is in Florida “enjoying retirement” for the next few months. He said he would “seriously think about it” if he was approached for the vacancy later this year. Scripps and Gonzalez could not be reached for comment. Whitmer appointees go before the Senate Advice and Consent Committee, which is made up of four Republicans and one Democrat and has 60 days to object. Whitmer has stated ambitious clean energy and climate plans in her first month in office, but how much can be accomplished with a Republican-led Legislature and major utilities charting their own course for generation? A coalition of environmental groups — led by the Michigan Environmental Council and the Michigan League of Conservation Voters — last week released an environmental “roadmap” for the new administration. 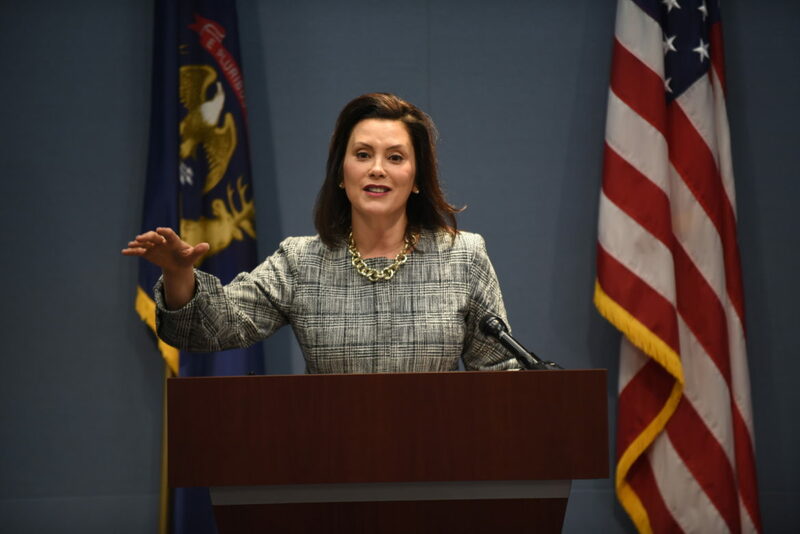 Reorganizing agencies to focus on climate change and clean energy, as Whitmer announced Monday, were among the recommendations. The roadmap also includes developing model ordinances for communities on renewable energy siting and electric vehicles, incentivizing and reducing barriers to distributed generation and solar programs, and local coal-transition planning, among others. “There’s so much a new administration can do in accelerating, guiding and catalyzing the energy transition that wasn’t done in the past eight years,” said Stanley “Skip” Pruss, a senior advisor for 5 Lakes Energy and former director of the state Department of Energy, Labor and Economic Growth under Gov. Jennifer Granholm. Pruss called the Snyder administration’s efforts on clean energy “meager.” A key accomplishment was 2016 energy reforms that boosted the 10 percent renewable energy standard by 2015 to 15 percent by 2021. But Snyder tended to favor energy waste reduction over renewables or emphasizing particular generation sources. Rivet added that multiple aspects of the 2016 laws are still being developed by the MPSC, such as rewriting interconnection rules, net metering and reviewing utilities’ integrated resource plans. Meanwhile, state Attorney General Dana Nessel has also sided with clean energy advocates in her first month in office. Last month, Nessel withdrew Michigan from four lawsuits challenging the Clean Power Plan and coal plant emissions. Former Republican Attorney General Bill Schuette initiated challenges against the coal plant rules and joined other states against the Clean Power Plan. (In both instances, Schuette was at odds with Snyder.) Advocates also hope Nessel will use the office to more strongly advocate for residential ratepayers. “Residential affordability in the energy space in a lot of ways fits hand-in-glove with clean energy,” said Charlotte Jameson, energy policy and legislative affairs director with the Michigan Environmental Council. Whitmer also appointed Liesl Eichler Clark to head what is now the Department of Environment, Great Lakes and Energy. Eichler Clark is the former president of the Michigan Energy Innovation Business Council and worked closely on removing barriers to clean energy deployment and electric vehicles. Eichler Clark was also deputy director of energy programs under Granholm. “Liesl has deep knowledge — she knows how disruptive these technologies are,” Pruss said.